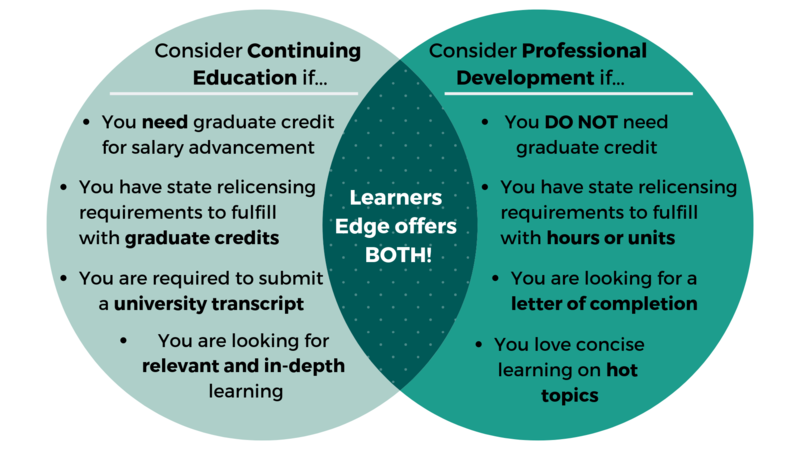 Below is a summary of how Learners Edge may help your continuing education and Wyoming teaching license renewal needs. This summary should in no way release individuals from their responsibility of ensuring that the course they take meets their professional needs. We hope it provides assistance in understanding how Learners Edge might help you in the accumulation of clock hours or graduate credit for salary advancement and the Wyoming teaching relicensure process. See the Wyoming Professional Teaching Standards Board website for complete WY teacher relicensure information. Standard License: requires completion of a minimum of 5 renewal credits, which may be college and/or PTSB-approved workshop credits and is valid for five years. If you are using any university or college credits to meet the renewal requirements, be sure to have the official transcripts sent directly to you. Once you have received all of your transcripts, include them in your complete application packet. If you have concerns about credit not counting toward renewal, contact the PTSB at (307) 777-7291.